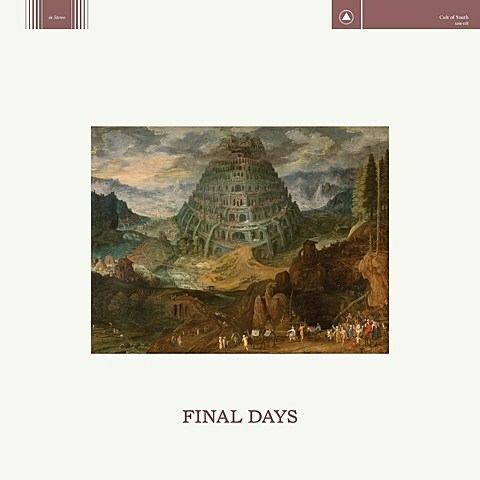 Brooklyn’s Cult of Youth released Final Days, the followup to 2012’s Love Will Prevail, this week via Sacred Bones. Main member Sean Ragon brought in backing musicians for Love Will Prevail, but has an all-new 5-piece lineup for this one including former The Hunt members Jasper McGandy and Christian Kount, as well as drummer Cory Flannigan and cellist Paige Flash. The new band fleshes out Cult of Youth’s sound more than ever before, and their mix of driving post-punk with dark neo-folk is at its best here. Check out two of its tracks below. Cult of Youth are celebrating the new album with a release show in their hometown TONIGHT (11/13) at Trans-Pecos with Occultation, Mommy and Aischrolatreia. Tickets are available. It’s their only US date before a European tour this winter.